Update 5/28/2015: If you've been waiting for this software update, your wait is over. Logitech has released the software and it's ready for downloading. Any Logitech Harmony remote that’s compatible with that company’s Harmony Hub will soon be able to control a host of connected-home devices, thanks to a free software upgrade that will be made available later this month. If you own a Harmony Ultimate Home, Harmony Smart Control, or Harmony Smart Keyboard, this update will deliver all the smart-home features found in the Harmony Home Hub. Why this matters: Logitech Harmony remotes were essentially home-theater controllers with limited home-automation capabilities until last September, when the gadget maker announced its Harmony Living Home product line . Logitech has been ramping up support for connected-home products ever since. 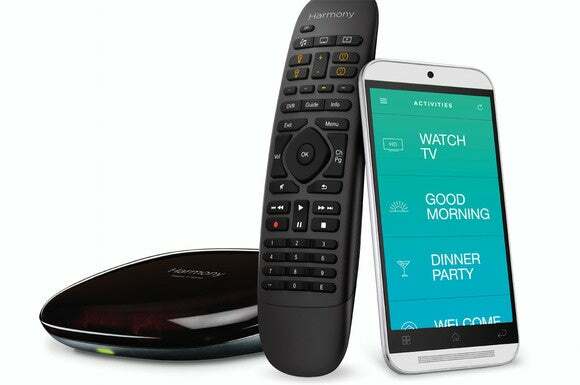 The Nest Learning Thermostat, Philips Hue LED bulbs, and the August smart lock are some of the other popular products Harmony Living Home remotes are known to work with. If you own the Ubi voice-controlled computer or an Ivee interactive clock, you can even trigger “Harmony Activities” verbally . Speaking of which, this announcement means there are now two more devices you can work with when coming up with new Activities. In case you didn’t know, an Activity is a group of commands that allow for multiple devices to be controlled simultaneously with just one touch. As an example, you can create a “watch a movie” Activity, which when triggered powers on your TV, Blu-ray player and surround sound speakers while ensuring your cable set-top box remains off. You’re basically limited by your imagination and the devices at your disposal. According to the company, a possible Activity involving the Nest Protect could be one in which your Harmony Home Hub automatically turns off your TV and other entertainment devices the moment the smart smoke detector sounds an alarm. “This Nest Protect activity gives families an even better chance of being made aware of the potential dangerous situation no matter where they are located in the home,” the company wrote in a blog post announcing the new integrations. The company sees the Rheem EcoNet integration as another reminder of its continued effort to push Harmony beyond the living room. You can use one of the above mentioned Harmony products to set up a schedule for your Rheem connected water heater, so that it heats water only when people will be around the house to need it.